In Stack 2.2 I've improved the removal of items with two minor features - now you must drag further to remove an item from the Stack (so less accidental removals), also there's an optional warning dialogue when removing an item. This allows you to cancel it if it wasn't intended. 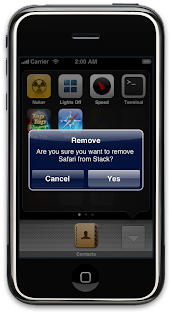 If someone needs to remove items from the stack they would have to go into settings, re-enable the option, and then remove. Just makes giving it to other people to mess around with a safer option. Just a thought, 2.2 is looking great! P.S: we'd LOVE the ability to choose which icon shows up on top of a stack. Right now, I have no idea how that's done, but I can never get it to work.